When I was ten, my parents sent me to the best place I had ever been in my life: summer camp. We rose early, ate well, and played outdoors all day – hiking, swimming, archery – I would have happily stayed until school started again. While there, I met the most amazing adult I had ever known. I don’t remember his name, but I remember his job title: Camp Naturalist. He knew the name of every plant or animal I asked about. Not only did he know their names, he knew stories about them – how they lived, where to find them, why they were important. I followed him around the way kids chase teen idols. 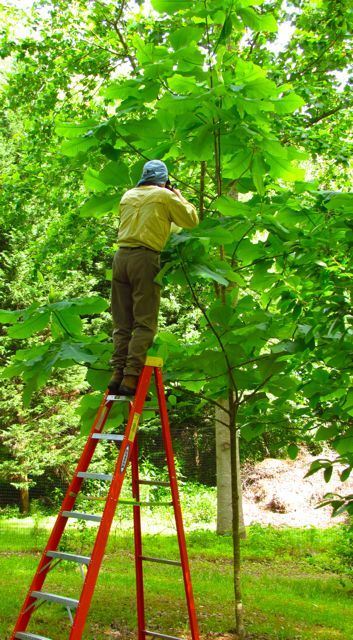 Before the end of the week, I knew what I wanted to be when I grew up – a naturalist. I wanted to know everything he knew – and more. Time flew. 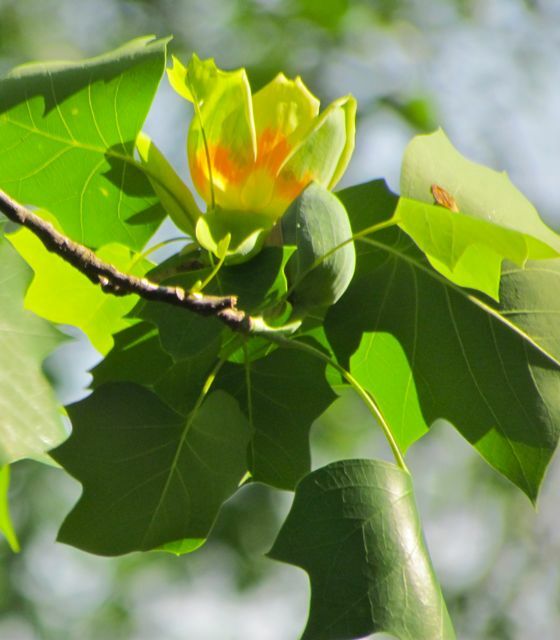 I studied the natural sciences in college and graduate school, but somewhere along the way, it became clear to me that while my enthusiasm for the natural world remained, my knack with the written word was more valuable in the “real” world. 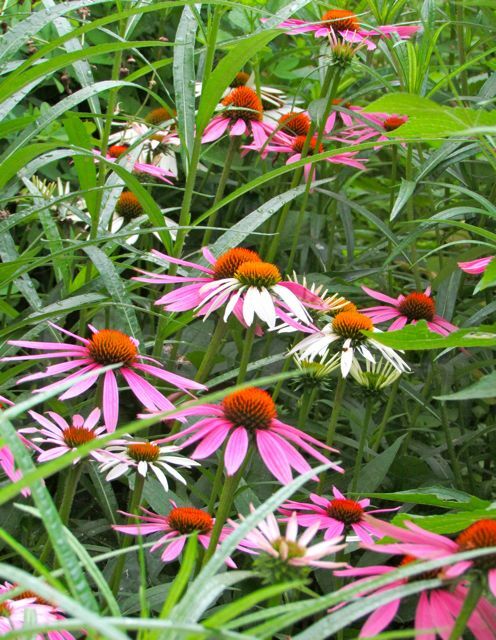 I became a professional writer with an abiding love of the natural world, and an obsession with the art and science of gardening. That’s why on this day when we Americans count our blessings, I find I am deeply grateful for the gift of time. Often in previous decades when I spotted an interesting flower or animal, I wasn’t able to stop and study it, or even take a picture of it. No time. But now I am blessed with that irreplaceable gift of time, which is why a month or so ago, I was able to be a midwife to metamorphosis. That’s overstating things a bit. 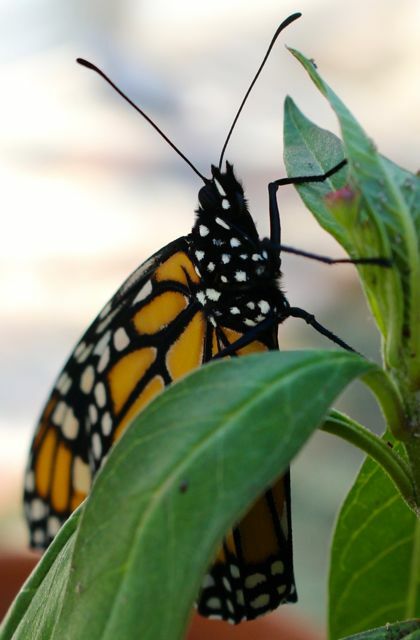 I didn’t actually help, but I did watch for hours on several days for several weeks, as the Monarch caterpillars that decimated the milkweeds I’d planted for them transformed themselves into chrysalises. And one emerald chrysalis successfully transformed herself into a perfect butterfly. I named her Mona. 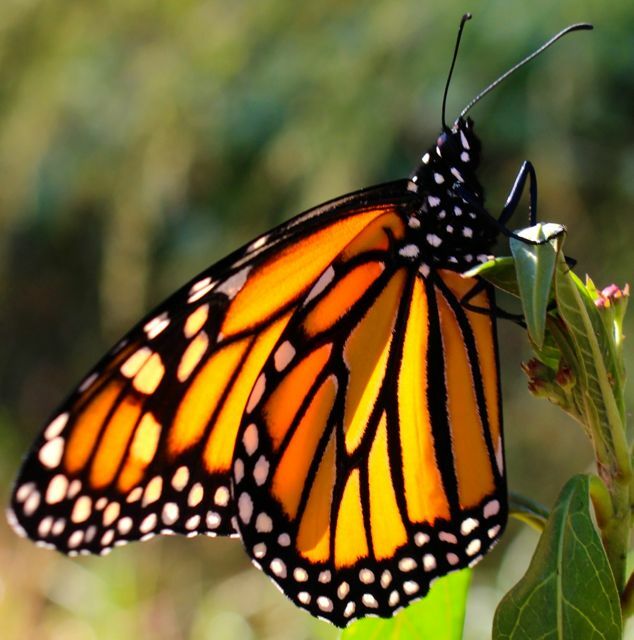 Today I want to share with you the journey I shared with a pair of Monarch caterpillars. Both became bejewled jade chrysalises, but only one succeeded in the final transformation to butterfly. Two caterpillars on my Common Milkweed had eaten it to a stub of its former self. On this day, one of the caterpillars transformed into a chrysalis. I had been checking on it regularly, but I missed the magic moment of metamorphosis. I was determined not to miss that moment when the second caterpillar changed. 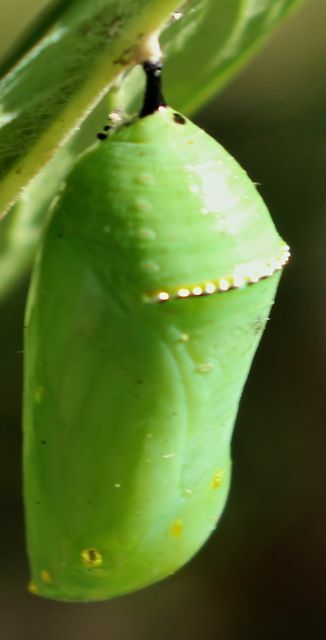 The first caterpillar transformed into a chrysalis when I stopped watching it for a few minutes. The second caterpillar attached itself to a stem and hung down just as the other one had, forming what looked like a letter J. I began checking on it every half hour, knowing from my research – and from watching the first one the previous day — that it would likely take several hours. Attached to the stem in its J-shapted meditation pose. The emerging chrysalis begins discarding the outer husk of its former self. Wriggling back and forth causes the old skin to gradually push upward toward the attachment point. The skin finally loosens and begins to fall. Leaving the husk of its former self on the ground below. I read that the change from chrysalis to butterfly usually takes 10-14 days, but I checked on them daily – just to be sure. A friend warned me that his Monarch chrysalises had been the victims of predatory wasps that bored inside and killed them. He suggested I cover mine to prevent a similar fate. I loosely wrapped the milkweed plants where the chrysalises dangled in the light-weight garden fabric I use to protect young squash plants from pest insects. The fabric allowed light and water to pass through, not directly touching them, but enclosing them within a predator-proof shield. I could detect no change in my emerald charges. The day after the second caterpillar became a chrysalis, my area saw two weeks of clouds and record rainfall. I wondered if perhaps they were waiting for the sun to return. 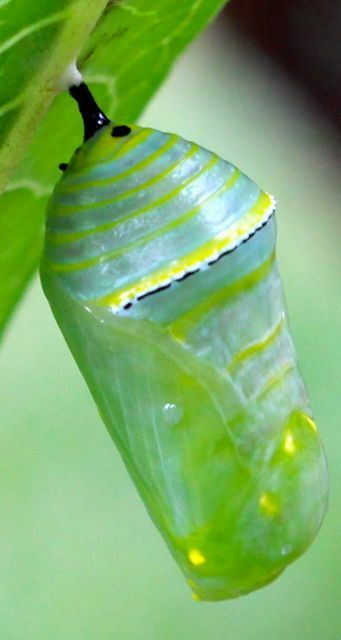 The color of the younger chrysalis now looked wrong, especially compared to the one formed a day earlier. That older one was showing wing color. The time must finally be drawing near! The first hard freeze of the season was predicted for the following two nights. I worried that the chrysalis showing wing color would freeze before it could transform, so I decided to cut off the stem to which it was attached and move it to my cool greenhouse. By this time, it was clear to me that something was wrong with the younger chrysalis. My research suggested its appearance pointed to a fatal fungal infection. For two days after I moved the chrysalis into the greenhouse, it dangled from its stem while I scrutinized it often, trying to discern any changes in its appearance. But my first visit on this day revealed a distinctive darkening of the chrysalis; brighter orange wing colors glowed deeper within. I knew from my research that transformation was near. I spent about three hours photographing and staring at it, willing it to metamorphose. Then I got hungry and thirsty, so I decided to run into the house for a quick refueling. In the twenty minutes I was gone, I missed the actual moment the butterfly emerged from the chrysalis! I concluded that real naturalists probably bring snacks to the field. There she was, dangling from the remnants of her now-abandoned transformation chamber. Determined not to miss another second, I took a zillion or so photos as Mona slowly stretched out her wings and began to dry off. I knew I had a female butterfly from my research. Markings of the two sexes are quite distinctive. Mona the Monarch was definitely female. Mona didn’t emerge until the sun was about to set. I was worried she wouldn’t dry off before another cold night gripped the area, so I left her in the greenhouse, instructing her to wait for me to come get her after the sun had warmed the air the next day. It looked to me as if Mona had barely moved overnight. She still clung to the remnants of her birth chamber attached to the milkweed stem I had anchored in a vase too heavy to tip over easily. Mona had barely moved overnight. My greenhouse in the early morning is shaded and cool, and I was growing impatient. The day was autumnal perfection – cloudless deep-azure skies and a bright warm-but-not-hot sun. I decided to carry the vase holding Mona on her perch outside to the sunny south side of my garage – a favorite basking spot of my local lizard population. Mona responded almost instantly to the kiss of warm autumn sun on her wings. Slowly she opened them wide to catch the full benefit of the sun. Then she closed her wings, meditated a moment, then opened them again. She repeated this process over and over for about twenty minutes, reminding me of fledgling Red-shouldered Hawks I had watched a few springs earlier as they took turns standing on the edge of their nest flapping their wings, testing the air, wakening flight muscles. 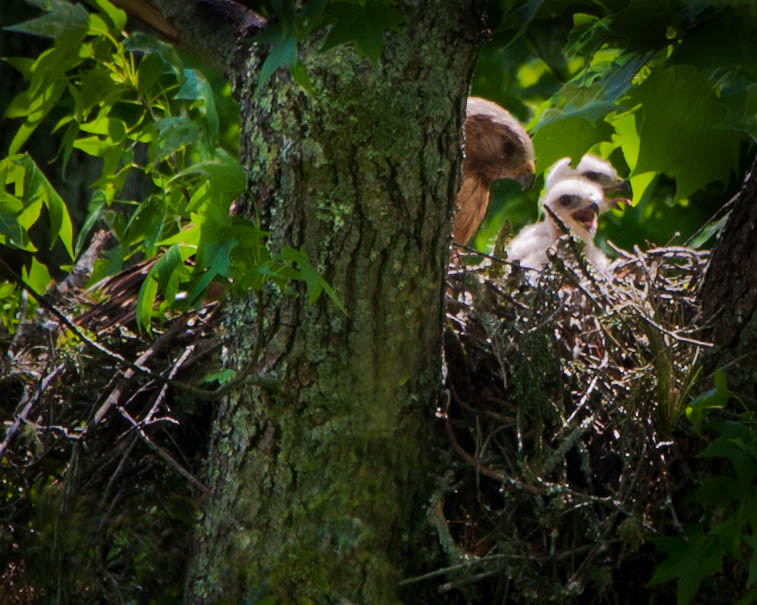 Red-Shouldered Hawk with two of her chicks before they were big enough to begin flexing their wings. I was constantly taking pictures during this time, but her decision to take flight was so sudden and powerful that I was unable to focus my camera in time for a parting photograph. Mona shot straight up, heading directly into the sun, reaching the top of nearby canopy trees in mere seconds. She made a decisive turn to the southeast and disappeared from my sight before I could breathe. Acting like the crazy woman some folks probably think I am, I found myself waving enthusiastically and wishing her a safe journey. Her flight direction would take her to the coast a couple of hundred miles away. 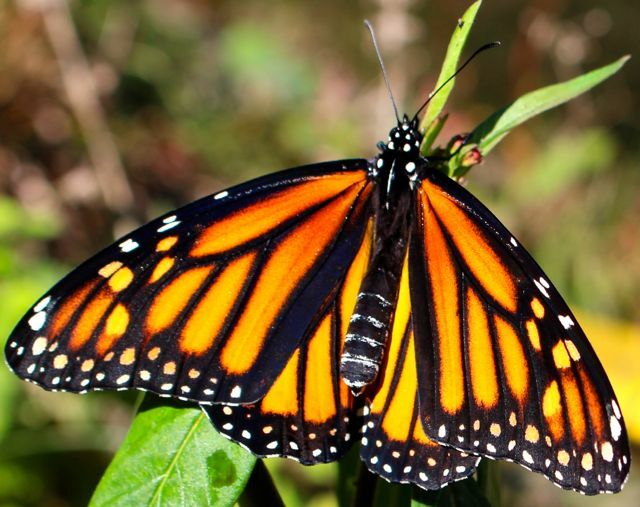 Many migrating Monarchs follow the Atlantic coastline south in the fall. Mona seemed to know exactly where she needed to be. Thanks to the gift of time, I was able to fulfill a ten-year-old girl’s dream of watching and learning from the natural world. How blessed am I, I thought to myself as I squinted into the sun trying to follow Mona’s flight path, to have the better part of three weeks to follow a caterpillar through its metamorphic journey? Since Mona left, I had another occasion to deeply appreciate the gift of time. Wonder Spouse developed a sudden, entirely unanticipated health issue that required surgery serious enough to merit two nights in the hospital. I am delighted to report that he is back to his energetic self, working his usual jam-packed schedule. But there is nothing like sitting in a hospital waiting room while the love of your life is in surgery to make you give thanks for the precious gift of time. Already back to full speed, Wonder Spouse has resumed his normal activities. Recent events in the world have probably led most of us to appreciate the gift of time. Even during our happiest days, lives can change in the space of a heartbeat. It seems to me to be an excellent moment to be sure I am using my blessing of time wisely, to share my gift of time with others as well as with that ten-year-old girl who wanted to know the name of every tree and bird she met in the forests she loved. That summer camp I loved was an Episcopal Church camp. My father was an Episcopal priest, so it was the obvious choice for his children. My feelings about organized religion are — shall we say — mixed, but when I think about the blessing of time, my mind inevitably turns to a benediction my father always recited at the end of every service he led. Support us, Lord, all the day long, until the shadows lengthen, and the evening comes, the busy world is hushed, the fever of life is over, and our work is done. Then, Lord, in your mercy, give us safe lodging, a holy rest, and peace at the last. This year, I send all my readers prayers for peace – and the precious gift of time. This entry was posted on November 25, 2015, 6:44 am and is filed under Native Wildlife, piedmont gardening. You can follow any responses to this entry through RSS 2.0. You can skip to the end and leave a response. Pinging is currently not allowed. Wow! This was beautifully written and beautifully illustrated, Cousin. Thanks for stopping by, Jane. Beautiful. I have been praying for you both. Happy Thanksgiving. I am glad you have been given the gift of time. It is most precious. Thank you, Caroline. Your prayers are appreciated. Happy Thanksgiving to you and yours! Thank you, that was a fun read! Beautiful pictures !! I’m glad you enjoyed it, Jenny. Thanks for stopping by!